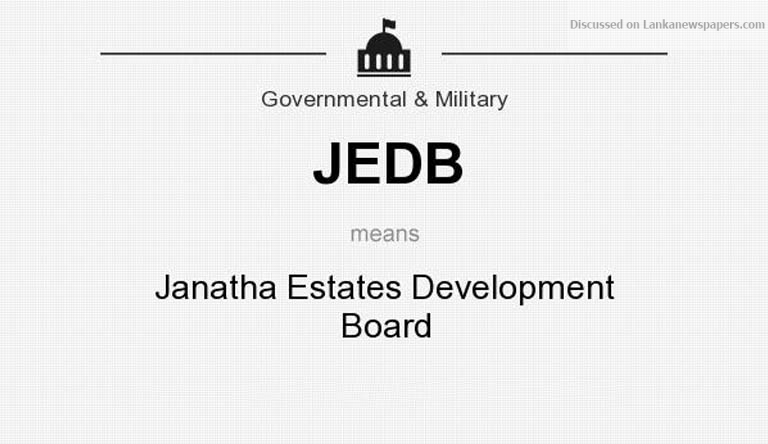 The Ceylon Estate Staffs’ Union, belonging to the Janatha Estates Development Board (JEDB), has slammed a decision made by the Defence Ministry to award a crucial army supply tender to a private company, threatening the viability of the struggling plantation company. The Defence Ministry is set on awarding the supply tender to procure the 35,000 kg of tea needed for the Sri Lanka Army every month, which the union charges would be taking crucial business away from the cash-strapped State-owned plantation company, the Daily FT learnt. This is despite the matter being taken up in Parliament by MP Buddhika Pathirana and several representations being made to the Defence Ministry and higher authorities including the Presidential Secretariat and Prime Minister’s Office to get the decision overturned. However, none of the discussions led to a favourable result for the JEDB. Defence Ministry Secretary and President’s Counsel Kapila Waidyaratne declined to comment on the issue. When the Daily FT first reported on the issue, Public Enterprise Development Ministry Secretary Ravindra Hevawitharana was still hopeful the JEDB would be awarded the tender by virtue of their product quality despite losing the bid. Two Cabinet decisions, one in 2005 and another more recently in 2017, to procure all the tea needed for State entities from the JEDB, had been selectively implemented by the Defence Ministry which procured tea from JEDB after the Auditor General raised the issue only to go back to a private procurement process for the 2018 supply. In December 2016 the Auditor General’s Department asked for explanations as to why the Army had deviated from the Cabinet decision in 2014. Further, the Committee on Public Enterprises (COPE) in February 2016 issued separate instructions for the JEDB to supply tea to all state-owned entities noting that the burden on the Treasury could be reduced by supporting the businesses of entities such as the JEDB which were involved in commercial activities with funds from the Government. However, the Defence Ministry had deviated from these instructions in 2018, calling for tenders for the supply of tea for the army. The business from the Army to supply 35,000 kg of tea every month has been a lifeline to the ailing estate company, with a negative balance sheet to turnaround. In 2016 the company added Rs. 93 million to the income through tea marketing, which recorded a loss of Rs. 4.24 million in the previous year. Pathirana, raising the issue in Parliament in March, alleged the move to award the tender to a private entity was the result of a corrupt deal brokered by a high-ranking official at the Defence Ministry. According to Hansard records accessed by the Daily FT, Pathirana also alleged that the official – who was named during the debate in Parliament – had promised the tender award to the private entity to cover up shortcomings in executing duties as a public official.